So I thought I'd start your day right and give you a few things to check out. 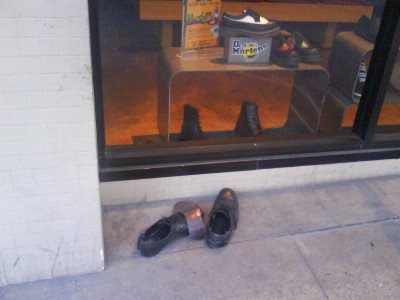 Here's a picture that I took on my way to work yesterday which made me stop and say... "huh..."
This is the Doc Marten store on Broadway and I wonder... what made him/her (whoever (s)he was) kick off shoes in front of a shoe store. I like to think that (s)he had the power to reach in and get the shoes (s)he really wanted instead of these "hoover shoes."